Prof. Thomas Rehle, Dr Mpumi Zungu, Prof. Ali Dhansay, Prof. Olive Shisana and Prof. Demetre Labadarios at the media briefing. The information contained in the study will assist policy makers and programme managers to identify specific target areas that need attention as part of a comprehensive approach to address emerging diseases and the social factors that impact on health, including the health system. 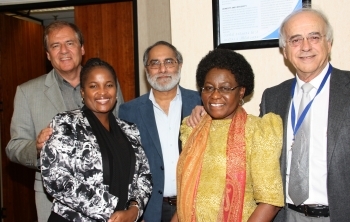 The HSRC’s CEO, Prof Olive Shisana and the national Minister of Health, Dr Aaron Motsoaledi launched the first South African National Health and Nutrition Examination Survey (SANHANES-1) at the HSRC Pretoria office.